The made for TV movie Hawke is a bio piece on the political career of Australia’s longest serving Labour Prime Minister Bob Hawke. It focuses on Hawke’s time as the head of the Australian Trade Union and his nine years as Prime Minister, the position in which he ultimately lost to Treasurer Paul Keating after a second challenge for the Labour Party leadership. This would have to be the shortest biopic I’ve seen, but it’s by no means a bad one. At only 90 minutes long it still manages to touch on many of the achievements by Hawke as Prime Minister. Such as the floating of the Australian dollar being one of the most significant which brought Australian into a time of great economic prosperity. 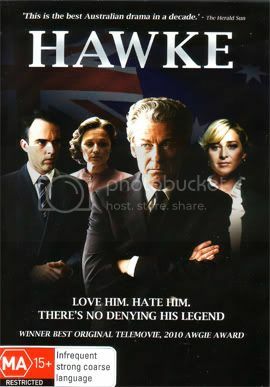 Richard Roxburgh gives an absolutely reverting performance as Bob Hawk, a hard drinking womanizer who overcomes personal demons to become a respective world leader. Roxburgh is in my opinion one the greatest actors Australia has ever seen. If you want further proof of that I suggest you watch his performance as corrupt N.S.W. Detective Sgt Roger Rogerson in the gritty crime mini-series Blue Murder. Other fine performances include Rachael Blake as Hawke’s loyal but long suffering wife Hazel and Felix Williamson, son of acclaimed playwright David Williamson is excellent as Treasurer Paul Keating. If you’re into politics or not this is an enjoyable look at one of Australians most beloved, influential and colourful political figures. I saw this when it was on TV and I must admit I didn't like the guy. Seemed like a bit of a jerk to me. I spent most of the film just feeling sorry for his wife. Yeah he was no saint and the way he treated his wife was terrible. But he was a man people could relate to, the average Aussie bloke. He was know as the working man's PM.